I can honestly say that I have over the years not always seen eye to eye with my parents but when they decided to think about their retirement living space I was astounded and pleasantly surprised by their unusual course of action. At the time they lived in the country in a 4 bedroomed family property with a bit of land near woodland. They had built their dreamhome when I was about 12 and before that had lived in a town. My mother liked her garden and my father liked the idea of playing his music when he wanted without disturbing neighbours. I grew up near the riverbank, planted a small garden and safely went for nature walks in the wood. At some point something triggered a change of direction. The house was 2.5 miles from the nearest shopping facility and my father's health deteriorated. My mother did not drive and they posed themselves the question how they would manage later on in their lives. They visited many retirement homes and eventually decided to settle in a university town with plenty going on. They settled for a 2 room apartment ( bedroom and living space) and decided to make the most of the space available by purchasing new furniture. Then they transferred all the things that were precious to them ( very little) and settled in. But what about the family home? First they invited friends to choose what they wanted and needed a little bit like a freecycle open house. Secondly they invited acquaintances and other villagers to come and choose what they wanted and needed. Then they got a company to clear out the rest of stuff and set about selling the house. A few months ago, we bought a small cottage where we live in 600 sq feet and the children live above in a similar space. Effectively its a bedroom, kitchen, bathroom and bedroom downstairs, and we are following some of the same principles with the difference that we are far from retirement. It is certainly not tidy and a work in progress but we only brought with us what we thought we needed. And even then I have established I have far too many serving dishes and crockery. Instead of having many rooms each room offers an area set up for different activities, whether it be reading, cooking, recycling etc. The children did the same and left behind a lot of stuff they had outgrown, games, videos etc We each have our own space and common areas such as the kitchen, shower room and living room. Yes it can get crowded but it is also cosy sitting by the fire, enjoying a hot drink and reading or conversing together. The running costs are lower and we have managed without much central heating so far by lighting the woodburner and the range in the kitchen. There is a small front garden full of wildlife and a paved garden at the back of the house which hopefully will in time have enough produce growing in pots. Life is simple. the owl lives in the big tree, the birds awaken us at dawn and there is a sense of personal peace and contentment as I go about our new home. So far I have not missed many items left behind. The last few weeks I have been looking at the amount of resources used made of paper and how these could best be dealt with. Despite best efforts to stop junk mail and catalogues it became apparent that it still streams in the house. Mail gets opened near the paper recycling box and generally there is very little actual communication that needs a response. Inbox- I have set up rules for incoming emails so the important ones get directed to their named inbox and junk box. It means being less overwhelmed by the amount of messages in the IN box. Turned off the 'ping' when an email comes in so I am not tempted to an immediate response. Unsubscribe from emails you are not interested in. Do not create accounts when purchasing items online and do not give out your email address when asked in shops or create an alias email for that purpose which redirects immediately to junk email. Bank statements and utility bills can now be received digitally as opposed to a paper copy. Try to find out which companies offer paperless billing and choose that option. It will reduce the mail being opened and also saves the company money. Set up a reminder monthly to check the digital bills and keep a copy on your computer. Mine are divided into business and private bills and accessible anytime. Letters from Government agencies, receipts and official letters are quite often kept in a folder and in any case should be accessible for 7 years. To save them on a computer you will need a scanner. I save information in 3 places : computer, backup locally and a folder facility in the cloud. I am a fan of Evernote as my back up because since having a stroke I have difficulty finding things and the notes saved on Evernote allow them to be searched by any word, as well as being available on mobile phones so in essence you carry the ability to carry vital information with you wherever you are. Simple Life Together has a podcast episode six,dedicated to going paperless and Brooks Duncan has a whole website dedicated to going paperless. Vanessa Hayes has a big range of videos to help organize anything in your home but in particular an action file. Books are available digitally as a direct download to an e reader or often as e-books which reduces the amount of book shelving space you need in your home. I like that idea a lot but often there are books I will refer to often and those I still like to have in a hard copy on the shelf. As far as magazines go, I am gradually changing any subscriptions to digital ones. Zinio have a great range of magazines and if you have an Ipad you carry with you a great amount of reading material. Cookery books and Craft Magazines are being revisited and the articles and recipes that are of interest are scanned in, using Evernote I can search for the recipe anytime. Many cookery books tell a story and are good companions for cooking seasonally. Cannabis nowadays is mostly known for its element tetrahydrocannabinol (THC), a narcotic substance found in about 10% Cannabis species . Hemp was first cultivated around the Caspian Sea and can grow as far north as the Baltic Sea and it was used as a plant fiber for textiles and later paper in China as early as 2700 B.C. Because of its connection to the narcotic element although not present in fiber hemp it is prohibited from cultivation in the USA and under severe restrictions in the EU. Most hemp comes from China Fiber hemp, however, contains virtually no THC and usually comes from THC low strains of Cannabis sativa and not Cannabis indica plants. In 1883 US law banned all hemp production ostensibly because of its drug use but in truth cotton farmers lobbied against hemp farmers. Thinking of all the chemical elements present in cotton currently I see hemp as a viable alternative sustainable fabric for clothes. Hemp is grown, harvested and processed much like flax. Hemp fabric is strong and durable though usually not as fine as linen. The word canvas derives from the Latin word cannapaceus (meaning:derived from hemp), and even in Roman times sails were made from hemp canvas. Hemp is very environmental friendly since it requires almost no pesticides and no herbicides. It grows fast with a high yield. Hemp seed is used in food preparations, cosmetics and animal feeding. The straw is used as biodegradable animal bedding. Nowadays, hemp is mostly used for paper making and grows much faster than a tree as a sustainable resource. Used for ropes :The stalk grows over ten feet tall and has been used in the shipping industry for centuries.It provides a very strong, durable and rot resistant fiber.. The short fibers of the stalk can be used in textiles as a replacement or blended with other fibers such as cotton. warmth inside during colder spells. But it is more durable than linen or cotton.Hemp holds its shape and is very resistant to stretching. It is resistant to mildew, mould and salt water. Hemp-blends with silk, linen, wool and cotton prolong the life of the fabric while retaining its soft quality at the same time. The original Levi Strauss jeans were made from hemp canvas. Hemp can be bought online in the UK here and there are a variety of products to choose from including hemp wool and fiber to spin. ( I can see I am getting carried away with possibilities). Another source is The House of Hemp with more yarns and colours. 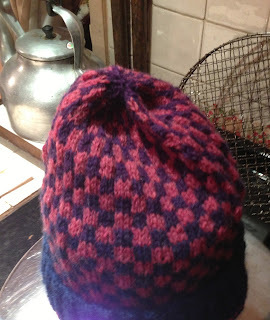 Making the summer top as my January project took a bit longer but time is not the issue here and it is still very cold. Having downsized to a 600ft square living space, my collection of yarn and fibres needs facing. I have been putting it off for years amassing 2 big boxes of sockyarn and yarns leftover from projects. Each time decluttering has happened I have bypassed these conveniently. Mea culpa.It is not until it took to filling an understairs cupboard and creating the sustainable wardrobe that I admitted that there are only so many sweaters a woman needs, so many socks we need and yes the time for facing the issue was here, procrastination over. Why do I have so much yarn ? Maybe a small fantasy of one day owning a yarn store. Why is knitting important and valuable to me? I knit for relaxation, learning a new technique and gifting. Any specific project in mind? First step: What do I want to keep and why? Do I have a project in mind? Do I still need that finished object? Plus an embargo on buying new fibers. Second step - How do I recycle the rest? Do I feel a sense of loss or bereft? 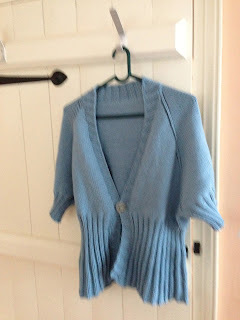 Small tinge of sadness but a great relief that I will not knit items that are unwanted and made of leftover stash. And the bonus is I will be knitting for relaxation with a purpose. Gifting woollens is after all one of the things I cherish so why not give that gift to someone else without the burden. What rhythm of life is appropriate to you and how to find out what is it? There are a number of stages in our life and to accept and know which one we live in now can help us tweak the energy we have. Children have a need for routine, adolescents need sleep to function properly, young adults, active in the workplace, young parents, the 30 age group, 40, 50, 60, 70 etc.Each stage of life brings challenges with it, You might be following that linear path as it unfolds or like me navigate between them. How many hours of sleep do you need for optimum energy? Do you sleep the required number of hours and if not what is stopping you? If you were to sleep the required number of hours what would be the impact on your energy? If you cannot sleep the required number can you build in a nap in the day? Our daily rhythms vary and although I know I am at my optimum energy when having had a good 8 hours uninterrupted nighttime sleep my teenage sons require about 12 hours and are a lot more present if I accept their rhythm. That means that their breakfast time is my lunch time and our main meal in the evening is their lunch time and that at 9 pm they are likely to need a snack. Even if it means we have different daily rhythms they meet at certain points. How many hours does it take you to do your work? when is the best time for you to use available optimum energy? Does your commute add time to that? Do you take time to be present when you eat a nourishing meal? Is there balance in my work and play? There can be very little variation on how we currently use our energy during the seasons and every week seems like another but it was not always so. Spring was a time of planting new seeds, new life, growth after a period of fasting and as the workload increased so did the length of the day. With the convenience of electric light we can modify that but do we use the time to its optimum? Summer was a time for tending the growing plants, eat fruits in season, socialising and usually a time to work and play at maximum capacity. Summer is the time of plenty, warm, long days. Autumn is a time of harvest and preparing for colder weather by processing the harvest and ensuring we will have our needs met in the colder days. Autumn offers us ambiguous days that remind us of summer but also of the winter ahead. Winter offers us the shortest amount of daylight hours and an opportunity to see if the fruits of our labours do indeed carry us through to the next season. Harvests are limited but it can be a time to slow down a little, stay warm, coset ourselves a bit and plan and gain strength for the year ahead. Each year and each period in our life has its own demands and thinking of what is important and what is authentic to us we can live with each 'now' in harmony or discord. Somehow this century we have challenged these rhythms of life by working day and night, every day of the week, eating everything whenever we wanted, anytime in the name of progress. We rarely notice a change of season or pace getting out in all weathers, to accomplish our life's work paced over the seasons of the year instead of over 365 days. Can you give yourself a day of rest each week and plan activities that will nourish you? Its an ongoing movement towards doing our life's work and staying present in the 'now' noticing the time of day, day of the week, seasons and how we function at our optimum level. It is a challenge but enables us to make our lives meaningful. The New Year brought such an impetus of things I wanted to do to simplify my life even further so I thought I would write out those resolutions and got a bit overwhelmed with all the changes I intended to make. January was used to look at those and I chose the sustainable wardrobe as my major project and then there was the garden, locally sourced produce in season, work goals, health, relationship, financial, energy efficient goals etc. Knowing full well the energy to achieve all of those would exhaust me and make life less simple to begin with. Some of these goals warranted investigating. What are the consequences of this decision. Is it in line with my major life goals or a distraction? Lets say your goal is to go and ski. Skiing happens at a certain moment when snow is available, so is time limited. This means travel and staying somewhere other than home. Requires a passport , special gear, toiletries and is going to make a dent in your budget. Now if its is in alignment with your authentic self( a need) you will go and find a way and have the satisfaction you have achieved something important with meaning. If however you go because you need a break from the rat race or the impulse came from a glossy brochure or advert, you may feel very discontented at the outcome. Despite wanting to live a simpler life a downshifting path to simplicity the inflow of information we get every day to flex those consumer muscles is so great that our brains get more hits for consumerism than to simplify life. In my goal setting I found that although I thought I had mastered the skill of differentiating between what is an important task and what is a want in my buying habits, this had not followed through in my personal life. And the most important habit to break is that of instant gratification so deeply engrained sometimes we are not aware of it. To reduce the impact of consumer messages we have a system to deal with the post, reducing the amount of junk mail, recycling the paper as the post comes in and ending up with the important mail that requires a response.Those pieces of paper then get devided into home or business and get dealt with when I give the home or business folder allocated time and attention. It can wait. and most of them incite us to buy something and influence our choices. Every time you buy something in the high street or online, it triggers a marketing campaign sending you emails whenever your profile shows up as a potential customer. You get asked for your postcode and what number you live in and there you are added to a mailing list. Every time you buy something the messages enticing you to buy increase. Companies are fighting for your buying power especially in a challenged consumer environment as where most people are tightening their belts after the spending spree for Christmas or for fear of losing their job. I know its a controversial issue because at the heart of it, we are asked to consume to create and keep jobs. A few years ago my son was waxing lyrical about the benefits of a certain washing powder, how it would fulfill my need etc. We are open to receiving these buying impulses and clever though they are they diminish our personal power to make decisions about what we need and want. Add to that the trigger of instant gratification, and we impulse buy because we want it, and we want it now. This was brought home to me while testing a new organizational app called The Habit Factor which as it happens accompanies a book , available tomorrow in hardback or instantly to a kindle and enabled me to list all my goals and then told me I could only concentrate on 3 of those goals. Three? The question I pondered this weekend was whose decision I follow when I want to achieve a goal, my own need or did the thought for that need originate as a marketing ploy? Therein lies the differential and unhappiness between the goals our authentic self chooses and the ones we often pursue implanted by a clever marketing campaign. Another app that brought me some insight was Astrid which enabled me to transfer those goals into steps I needed to take to achieve the goal and then allocated time in my schedule to do the tasks necessary. Three goals are sufficient to fill a whole diary and both these tools have been instrumental in helping me choose my three most important goal allocated to the three most important roles. By the time I consider my health, family and work I have my three major areas of goal-setting. Sitting here cup of tea in hand, I wanted to take stock to see if all the things I had planned to do in January got taken care of and what was left undone. As usual I had far too many things on the list to accomplish ( even in hibernation mode) where I get caught up in the enthousiasm of New Years resolutions. I did spend January planning month by month what I intended to do but then nature has a way of stalling my to do list regularly and refocus on the present moment. The snow arrived and clothed the roads with a blanket, well everything was white, cold and I listened to the frantic movements of the birds in the garden who were probably looking for food. I so enjoy the birdsong during the day and my contribution is to feed the birds in winter when I can. I notice the wildlife and nature now as where some years ago, I would be more focussed on getting to work and how this or that meeting would be chaired. Being mindful of 'NOW' means being open and present and I notice more of my surroundings and its opportunities. Being snowed in helps. Nature provides its own version of a duvet day and while clothing the outside with a covering of magical snow I responded by lighting the woodburner, feeding the birds and making a celeriac soup. Whatever I had planned that day got superceded by the weather conditions. Sometimes nature provides us with opportunities to help us recognize that we need nurturing. The shop papers were not delivered and neither did lorries make it to the village but farmers came with their landrovers to help and everyone in the community did what they could to take part and check on housebound neighbours. Children had a rare snow day from school ( as the buses did not run) and the day seemed to bring out a carefree play to all concerned. I picked up my bag of leftover yarns and dedicated the day to making a little hat and reading about fair isle knitting, a technique still to be mastered. My to do list fell by the way and at the end of the snowy duvet days I felt I had accomplished a new skill which did not figure in my original plan of the day. A snow day may be inconvenient and here it stops the routine dead. Many are unprepared and struggle to continue in the forward movement created by a need to struggle against nature to fulfill a personal to do list. Rarely do we stop and question whether by going out and following our daily work routine, we are taking a risk of damaging our cars, other people or our health. The diary is so full that taking a moment to stop, breathe and be still is far more frightening than taking the slippery road outside. Its good to focus our mind towards things and tasks that need to be done but a duvet day gives us a rare opportunity to reflect on what nurturing ourselves can accomplish.